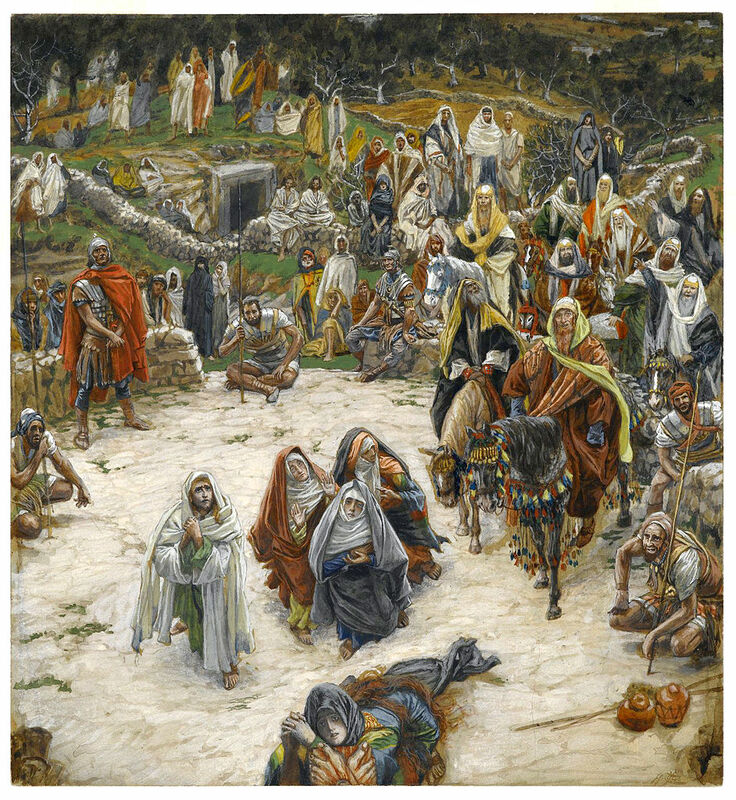 Look at this crowd: in James Tissot’s painting, excited people await and greet Jesus’ entry into Jerusalem. Two things are obvious about his arrival in the city. We notice the huge and enthusiastic crowd. And, we notice the object of their attention, Jesus riding on a donkey. At first, we naturally assume an affinity between these two things. The crowd is joyful about Jesus precisely because he is the answer to their questions, and the apparent solution to their concerns. Who he is seems to fit neatly with who they are, and with where they want to go. After all, who wouldn’t be happy when long-nurtured hopes and expectations are about to be fulfilled. In other words, as Matthew describes Jesus’ arrival in the city, the crowd’s greeting of him suggested a similar hope, that he might vanquish the repressive powers causing God’s people to suffer. This Nazarene might be the one to make God’s Kingdom present in their time. These observations can help us appreciate how Jesus was greeted when he arrived in Jerusalem, and how he was viewed soon after. For, like many leaders in history, he was the object of an immense amount of hopeful projection. Consider again at the crowd in Tissot’s wonderful painting of Jesus’ arrival. How many of them are looking directly at him? And of those, how many actually see him, and for who he is rather than for what he represents among their pre- existing desires? Notice how many in the crowd are carried away by the moment. They are excited by imagined possibilities, rather than by the Kingdom concretely at hand. This situation is not merely of historical interest, nor is it primarily about other people, living at another time. Jesus’ arrival in Jerusalem is also about us, and about why we are drawn to worship during Holy Week. For his arrival invites us to consider our intentions this week, as we greet with palms our Lord’s arrival. And it prompts us to consider how we might best walk with him through the rest of the week. This image is from James Tissot’s painting, The Procession in the Streets of Jerusalem. I am indebted to N.T. Wright regarding the specific references to earlier biblical precedents for the way Jesus was greeted upon his arrival in Jerusalem. This reflection is based on my sermon for Palm Sunday, which may be accessed by clicking here. Perhaps the only thing more memorable than driving over the Golden Gate Bridge may be to pass under it on an ocean-going ship. I was lucky enough to have that experience five times before I was a teenager. Many of us assume the name for this bridge is related to its warm color. But the name comes from the ocean straight over which it stands, though it does not derive from the Gold Rush. Rather than mimicking gold, the bridge’s official color—“International Orange”—was chosen to contrast with fog. A story is told about when that color was first applied. Painters dabbed splotches of it on the heads of curious seagulls. Pretty soon, Bay Area birdwatchers reported a new bird species, which was called the California Red-Headed seagull! Until 1964, the Golden Gate Bridge had the longest main span in the world. Yet, its basic design isn’t unique. We know this from other suspension bridges, which are found all over the world. Bridges of this kind have two main towers, steadied in place by their suspension cables, which are anchored in the ground. From their anchor points, these substantial cables ascend to the top of the towers, and then gently descend again to the center of the bridge. From that low point, they again soar up, to the top of the opposite tower. The slightly arched roadway across is literally suspended from these main cables, by small support cables that hang from them. Here, in the beauty of this simple design, we find a helpful spiritual and liturgical metaphor. Reflect for a moment about two significant Sundays in the church year. One is the last Sunday after Epiphany, or Transfiguration Sunday, and the other is Easter Day. Transfiguration Sunday is the last Sunday before Lent, and Easter Day is the first Sunday after Lent. Imagine these two Sundays on the Church calendar as being like the two towers of the Golden Gate Bridge. Transfiguration Sunday, coming just before Lent, is like the south tower of the Golden Gate bridge, on the urban, San Francisco, side of the straight. And, Easter Sunday is like the north tower of that bridge, on the less familiar and historically rural side of that navigational channel. The season of Lent stretches between these two Sundays like the main span of a bridge. Here is the crucial part ~ every year we need to make this liturgical crossing. And, like the great towers of a bridge, Transfiguration Sunday and Easter Sunday uphold us all the way across our Lenten journey. This posting is based on my homily for the Last Sunday after the Epiphany, which explores the parallel between the revelation of glory that we see in the Transfiguration, and the glory we see in the Resurrection (click here for a link to it). One of the most creative and thoughtful novels in recent years is Yann Martel’s, The Life of Pi. It’s both imaginative and evocative. The novel explores our knowledge and wisdom about animals, while also reflecting on our knowledge and wisdom about God. Pi, the narrator, was a double major at the University of Toronto, in religious studies and zoology. Before that, he grew up in southeast India, where his father had run a small zoo. Near the beginning of the book, Pi reflects on an unexpected reality about zoo animals. Most of us assume that zoos should be large open parks having extensive land preserves, with all the animals roaming about together. Otherwise, we think zoos are cruel, artificially propagated institutions, which have no genuine respect for fellow members of the animal kingdom. Pi challenges us with some interesting empirical observation. Zoo’s actually resemble our own houses, in a positive way! In prehistoric times, our ancient forebears had to roam, from cave to stream, and from animal habitat to places where fruit bearing plants could be found. Now, we have the modern equivalent of these things in a limited spacial structure we call our home. Animals in the wild face immense challenges: how to find food and water, safe places to rest, to mate and rear young, and free of predators. Usually this requires large tracts of land. But zoos, like the houses that serve us, provide these things in a limited compass, which actually contributes to animal contentment and well-being! Their enclosures provide the security of a known-place, which they feel is theirs. Like us, animals are territorial. A modern notion of freedom has thoroughly permeated our culture. We assume that freedom is best defined in one way ~ ‘freedom is the absence of limits.’ Freedom is ‘no one getting in my way,’ no rules limiting me, and no constraints on what I want to do. So, we imagine that the same must be true for animals, and especially those in zoos. As exciting and liberating as this may sound, it is actually contrary to animal nature—and therefore, probably also to our nature. Pi offers this observation: “An animal inhabits its space, whether in a zoo or in the wild, in the same way chess pieces move about a chessboard— significantly. There is no more happenstance, no more ‘freedom’, involved in the whereabouts of a lizard or a bear or a deer than in the location of a knight on a chessboard. Both speak of pattern and purpose.” But, ironically, this is the very thing we resist! We somehow assume that we are less than human when we go through life wedded to pattern and purpose, and when we adopt habits that shape our character in enduring ways. These are precisely the features of the modern mind, which make it so hard for us to hear what Paul says about freedom, in Galatians (For freedom, Christ has set us free). Our modern notions also separate us from our nation’s Founders, who were just as concerned with what freedom is for, and not simply what freedom is from. Adapted from my homily for Sunday, June 26, 2016, which may be accessed by clicking here. We live in a highly visual culture, where information is largely communicated through images. As a result, we often think with mental pictures. But are the images we commonly associate with biblical texts actually faithful to Scripture? Our most familiar image of the Good Shepherd may come from Tiffany windows showing Jesus carrying a lamb. Lushly colored, like much of late 19th century art, and romantic in expression, Tiffany windows remain popular and continue to be influential today. And yet, the Tiffany approach to the Good Shepherd may have more to do with the Luke parable about the person who goes in search of the one lost sheep than John’s presentation of Jesus’ words, where he identifies himself as the Good Shepherd of the flock. 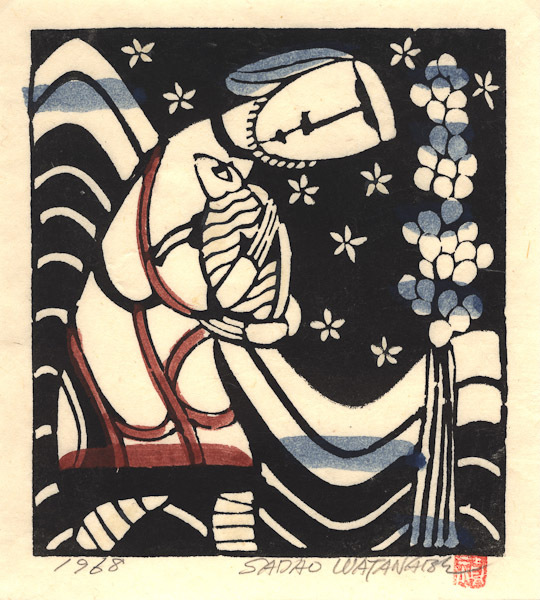 Japanese Christian woodblock artist Sadao Watanabe made several prints of the Good Shepherd. This one is beautifully simple and typical of his hand-made cards. Looking over his life’s work, we can see significant parallels between his prints and historical European art. In particular, his portrayal of biblical people is influenced by medieval Christian stained glass and manuscript illustrations, as well as by Eastern Christian iconography. In this print, we see how an Japanese artist shares our Western tendency to see the Good Shepherd in terms of our Lord’s relationship with us as individuals. Like familiar Tiffany images, Watanabe portrays the Good Shepherd who carries a single lamb. Less familiar are other elements of his print. The artist depicts a large vine laden with grapes, which represent at least two ideas. The promised land toward which God led Israel was filled with vineyards bearing abundant fruit. And in New Testament, the fruit of the vine gains eucharistic significance through our Lord’s cup at the Last Supper. Surrounding the shepherd figure, we see flowers, likely representing the passion flower, symbolic of our Lord’s saving death. Behind the main figure are large and small bands of white against a dark background. Though the symbolism here is not immediately clear, the artist may have had in mind the words of Psalm, 23, and the valley of the shadow through which the Lord safely leads us. These distinctive aspects of Watanabe’s Good Shepherd do not necessarily set it apart from features of Tiffany Good Shepherd windows. But notice this subtle aspect of Watanabe’s print, which reflects the influence of Christian medieval art. Whereas Tiffany images of Jesus expressively portray his presumed personality and character, Watanabe’s Shepherd resembles traditional iconographic images, where the focus is more on the Lord’s action, and less on his personality. Along with the blank intensity of the eyes, the most strongly communicative aspect of the Jesus figure is his hands, and not his facial expression. Watanabe focuses on what the Good Shepherd does; and what the Good Shepherd does is devote himself to the sheep. Sadao Watanabe, The Good Shepherd, 1968. See John 10:11-18; compare Luke 15:3ff. Click here for a link to my Sunday homily on the theme of the Good Shepherd, and on historical and artistic reflection which it has inspired. We are accustomed to looking up at him on the cross. Good Friday may prompt us, at least for a moment, to allow a reverse in the direction of the gaze. For we are the objects of his attention, and of his love. If we discern anything about the meaning of Holy week, and the events within it, it is this: He acted for us, and not for himself. And God was in him, as he did so. James Tissot pictures Jesus’ view from the cross on that dark afternoon, two thousand years ago. Just below his feet, he saw Mary Magdalene, prostrate with grief, showing her love for him. Just behind her, cloaked in dark blue and white, is his mother, hand across her heart, experiencing the sorrow it had been predicted she would endure. And to the left of Mary, in Jesus’ vision, we see the beloved disciple, John, in a white outer cloak over a green tunic. These three, and the two others behind Mary, are sympathetic figures. They have come to be by him in his darkest hour. Others in Jesus’ field of vision may vary in their sympathies with his suffering. The Roman soldier cloaked in red could be the centurion, about whom we read in the Passion narratives. Standing by the cross, Tissot depicts him with a pained look on his face. He is beginning to realize that Jesus was innocent of the charges brought against him. By contrast, the two other soldiers near him appear either puzzled or disgusted by the whole situation. As we survey this scene portraying Jesus’ field of vision from the cross, we cannot miss the group of men on horseback in the middle-ground. They are Scribes or Sadducees, those with power and wealth in the city, who had argued for his crucifixion. Some are shown taunting him. Some appear self-satisfied. And at least one is looking up at the darkening sky, which is already putting the upper edge of the scene in shadow. He has acted for all these people, and especially for the ones who have turned against him. He looks upon them with love, and with a plea for God’s forgiveness. He knows what is in people’s hearts. What we so often forget is that he knows us better than we know ourselves. We may not understand how he knows us; but we do know that he knows us. We know that he loves us. And this is enough. This is not a time for us to ponder the unknowability of God. This is a time to focus on our vulnerability, and our total knowability in God’s eyes. It is a time in which to contemplate the complete self-revealing of God, by Christ, for us. And to remember that he did this on a cross. James Tissot, What Our Lord Saw From the Cross. For a link to my Good Friday homily, from which this is adapted, please click here. At the summit of Mt. 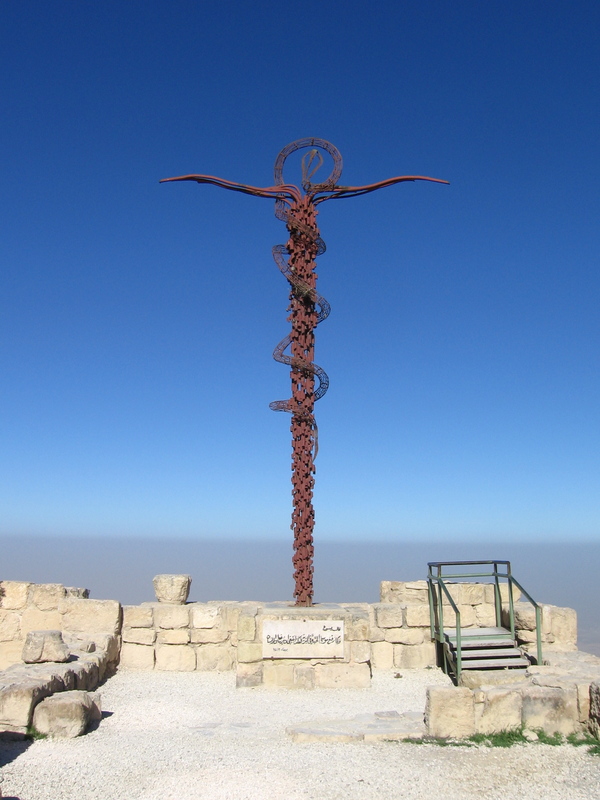 Nebo, in Jordan, there is a tall sculpture that commemorates the Bronze Serpent. This is the serpent mentioned in the book of Numbers, in a story about Israel’s wilderness wanderings. The metal sculpture, by Giovanni Fantoni, features a serpent twisted around a pole. Its head, depicted at the top, is encircled by a loop of its body. The fact that the serpent story occurred at a different place in the wilderness raises the question of why this sculpture is positioned on Mt. Nebo. That location suggests one reason. From the lookout next to the sculpture, people can see Jerusalem on a clear day. The view to the west includes Jericho and other sites in Israel. Perhaps you have noticed African-American churches named after Mt. Nebo. From it, Moses was allowed to see the Promised Land before he died, without ever getting there. Mt. Nebo, and seeing the Promised Land, have become metaphors for the promise of deliverance and salvation. In recent history, this theme powerfully shaped Martin Luther Kings’ last sermon, on the night before he was assassinated in Memphis. See the film of it, or read his words. They are stirring. From the biblical story we learn one reason why the serpent became metaphor for healing and deliverance. When Moses fashioned the bronze serpent, the repulsive sight of a snake in the wilderness was transformed, so that it became a symbol of his peoples’ reconciliation with God. Here, we see how the sculptor was thinking of more than the biting serpents. Clearly, he was also mindful of Jesus’ words in John 3. In addition to depicting the serpent made by Moses, we see how the looped body of the snake around itself also suggests the head of one who has been crucified. We also notice the lyrically shaped crosspieces, evocative of outstretched arms. The sculpture reminds us of Jesus’ words to Nicodemus, “Just as Moses lifted up the serpent in the wilderness, so must the Son of Man be lifted up…” Speaking figuratively, Jesus risked likening himself and his probable death to the bronze serpent. Seeing him lifted up, repentant hearts recognize the power within this new symbol of redemption. Think about the Cross. Over time, an object representing a dreadful death has come to symbolize a new and different meaning. Something truly frightening was transformed by God into a symbol representing reconciliation with our fear of death. The Romans used the cross as an instrument of violent subjugation, effectively employing it to suppress the will and spirit of nations under their dominion. Through the centuries, the cross has become a symbol of life, and of love. Seeing the One lifted up, opens to us the promised land of new fellowship with God. The Bronze Serpent, by Giovanni Fantoni, on Mt. Nebo, in Jordan. See, also, Numbers 21:4-9, and John 3:14-21. For a link to my Sunday homily on this theme, and referencing both the sculpture and M.L. King’s last sermon, please click here. 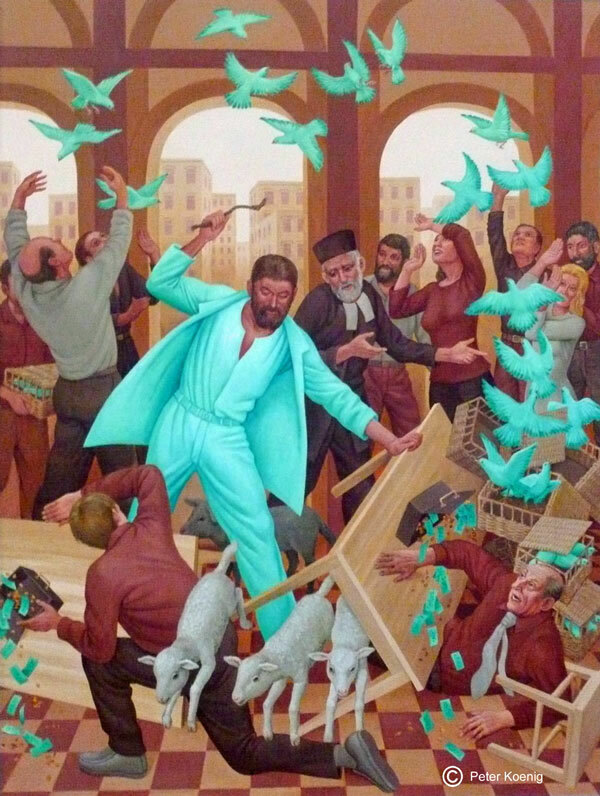 Peter Koenig offers an evocative view of one of the most dramatic stories in the New Testament, Jesus’ so-called ‘cleansing of the Temple.’ We can’t help but notice the aquatic colored clothing worn by the Christ figure, matched by the at-first-surprising color of the doves. Fairly quickly we notice the similar but slightly differently colored paper currency falling out of the overturned cash boxes of the merchants and money-changers. Though both doves and lambs might be presented as forms of offering in the temple, the lambs are not depicted in the same hue as the doves. Some translations render Jesus’ critical statement as, “Stop making my Father’s house a marketplace!” Another way of translating that last word is “house of trade,” which may better locate the object of his anger. Throughout the Bible, from the days of the Temple’s prototype in the wilderness, to its fulfillment in the New Jerusalem, God provides a place and a way for us to offer gifts. The ‘exchange’ that is the object of his wrath may not be so much the trade of money for sacrificial animals, as it is the spirit of exchange that shapes and colors much of the prayer occurring within this place. By overturning the tables and driving out the animals, Jesus points to a new Temple where we meet God. He becomes the new place of offering, where pure offering replaces all the false substitutes we create by our efforts to engage God in an exchange. Why the aquatic colored vesture for Jesus in the painting, as well as for the doves? I am not aware of any explanation by Peter Koenig. The whip in Jesus’ hand reflects a detail unique to John’s Gospel. 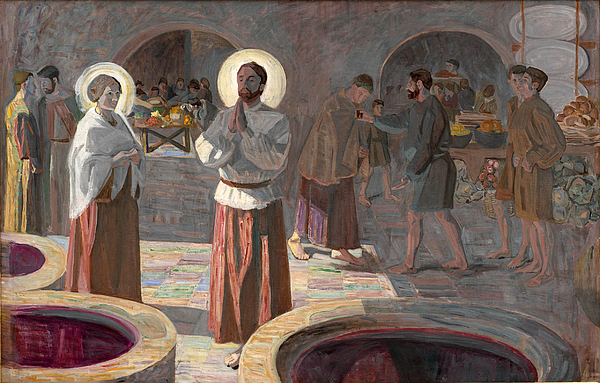 The color of his clothing may therefore be connected with his statement on another visit to the Temple, implying that he is the source of living water. Living water and the life-giving Spirit are thematically linked in the Fourth Gospel. As a dove does at his Baptism, the similarly-colored doves may represent the Holy Spirit. Here we see the Lamb of God, who has come into the world in order to offer it up to the Father in the Spirit. Entering the Temple, he sends earthly lambs scattering, and pushes aside false ways we use to secure life and happiness through exchanges we try to make with God. Instead, Jesus invites us to join him, in his whole and complete self-offering. The Cleansing of the Temple, (C) Peter Koenig. For this and other images by the painter, please see the website from which this painting was retrieved, http://www.stedwardskettering.org.uk. For a link to my homily on the theme of offering and exchange, in relation to John’s account of the Cleansing of the Temple, click here. Alexander Calder approached the creation of public sculpture in a unique way. His largest pieces are often set in the midst of cities, placed on plazas between modern office buildings. We have a beautiful example here in Grand Rapids, with another large one in the same bright red color, nearby in Chicago. Unlike them, Mountains and Clouds, in the Washington Hart Senate Office Building, is painted in matte black. This works well against the white marble and clear glass in the atrium where it stands. Each of these three “stabile” sculptures provides a lyrical counterpoint to the linear and grid-like facades of the office buildings. Mountains and Clouds is unique in that it also involves one of Calder’s mobiles, suspended from the atrium ceiling. We know that monumental sculptures from earlier times often portray honored heroes, standing or on horseback. By contrast, Calder’s large works are abstract, and don’t simply draw attention to themselves. His plaza sculptures do more. They lead the observer’s eyes to notice the interplay between his work and the spaces around them, as well as their contrast with nearby buildings. One doesn’t just view these sculptures; one engages with them, and with the larger context of their placement. Here, we must mark a paradoxical aspect of all public sculpture, which indicates something more about us than it does about the art. Many people work everyday in buildings around where these sculptures are situated. But they are just as capable of being as inattentive to these pieces of art as they are to their parking spaces or to the doors of their offices. With the stabiles’ soaring heights and reaching curves, Calder’s works are expressively shaped and tremendously uplifting. But our focus on our work and our worries, and the practical things we need to do, blinds us! And it diverts our attention from something truly beautiful, right there in front of us. I note all this because the same thing can happen when we encounter the first verses of John’s Gospel. Often called the prologue to his Gospel, John has written a passage shaped by poetic beauty and filled with lofty theology. Yet, we have a tendency to focus on what is immediate and practical, and on what seems narrowly relevant to our everyday concerns. And so, we can go right by this Gospel ‘work of art’ just as people hurry past the great Calder downtown, absorbed with getting to their offices. In both cases, something sublime lies before us, waiting for us to engage with it. But sometimes we don’t see it because we aren’t really looking for it! 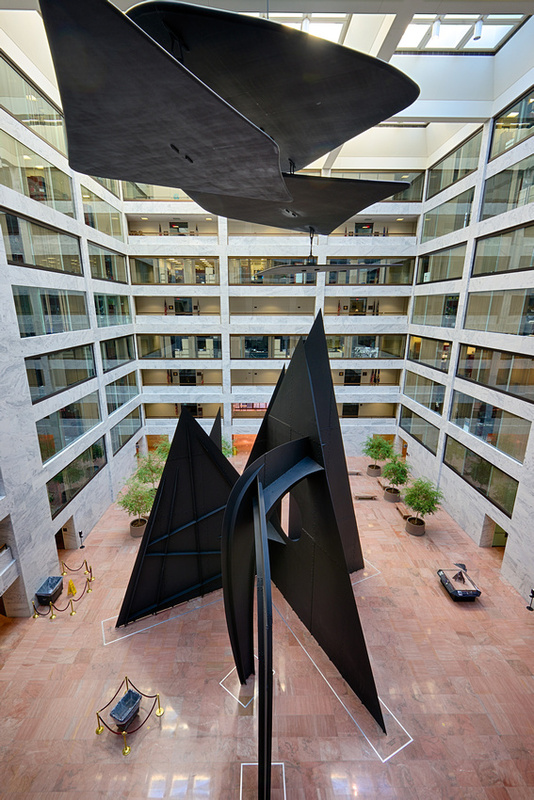 Alexander Calder, Mountains and Clouds, 1976 (installed 1986), in the Hart Senate Office Building, Washington, D.C. The beautiful photograph is by John Baggaley, and is used by permission. For a link to the website of this talented photographer, click here. For further reflection on Calder’s stabiles, especially his Mountains and Clouds, in relation to the Prologue of John’s Gospel, click here.